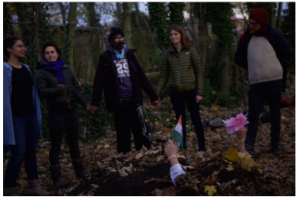 After the nine-week residency in the Catalan pyrenees, artists, activists and social change makers from all over gathered in Paris to bring a different voice to the climate conversation. Eroles project teamed up with Jungle House collective, TierrActiva and Stendhal collective to create an international autonomous community in Le Pré-Saint-Gervais, Paris for five weeks during COP21. L’Annexe served as a hub for people creating, running, performing or holding creative climate interventions throughout the city. We had workshops in collaborative arts practices, street theatre workshops, guided meditation and yoga, social sculpture, legal briefings for international activists, creative direct action for beginners, carbon colonialism and corporate control, burnout prevention. L’Annexe also served as a base for cooking team Kokkerellen, who prepared vegan meals for hundreds of people working on actions, everyday, throughout the city. 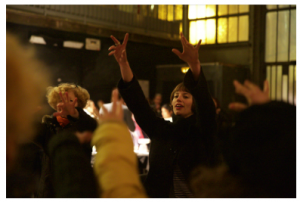 The artists and activists of l’Annexe planned and executed creative actions throughout Paris. These ranged from street theatre performances to immersive food events to workshops on sustaining engagement.